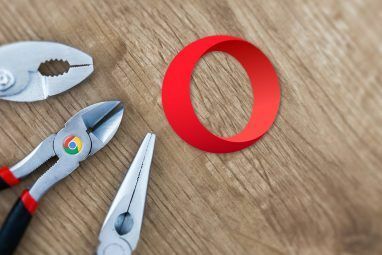 But these two articles aren’t about why Google Chrome is a better browser The Better Browser With Great Features - Google Chrome The Better Browser With Great Features - Google Chrome Google Chrome presently is the most popular browser on the planet. It took Chrome less than 4 years to rise from barely 1% market share to where it is now. Globally, more than one out... Read More than all the others. 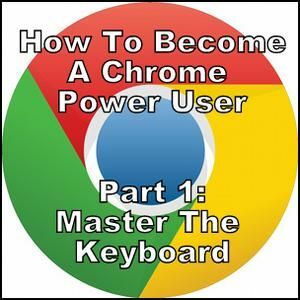 This is about how you can become a better user of Chrome – a power user. And more specifically how to start the process simply with keyboard shortcuts. Using keyboard shortcuts in general can really boost your efficiency, but focusing on Chrome-specific ones is what this section is about. There are several that you can use to improve your browser experience. If you’re new to using keyboard shortcuts, it might seem less efficient at first, but if you keep making yourself use them and trying to add new ones to the mix here and there, you’ll find that you too can be a keyboard Jedi master. Disclaimer: There are many instances where the Windows and Mac shortcuts are the “same” where the Control (Ctrl) key equals the Command (Cmd) key and the Alt key equals the Option key. Unless otherwise stated, assume that this is the case. Sure you can go back and forth with the backwards and forwards arrows on your browser, but your hands are already at the keyboard, so instead try using the Backspace key (Delete in Mac). To go forward, just do Shift+Backspace (Shift+Delete in Mac). Now what about if you want to navigate through the page itself? Perhaps you’ve scrolled down and now want to go back up. Instead of spending the time scrolling, just tap the Home key. Alternatively, you can press the End key to go to the end of the page. You can also use these in other situations, such as typing a comment and you want to quickly get to one end or the other of it. Perhaps you just use your touchpad on your laptop to do this, but if you use a mouse or are at a desktop, you don’t have that option. Using a mouse you can hold Ctrl/Cmd and scroll with the wheel. If you don’t use a mouse, but want to use a keyboard shortcut, Ctrl++ zooms in and Ctrl+- zooms out. Probably the most useful one though is Ctrl+0, which restores a webpage back to the default size. Why is this the most useful? Because I’m always accidentally zooming in with my touchpad. So quickly being able to restore the webpage to the original state is a nice option. Sooner or later, if you haven’t already, you’ll come upon the need to refresh a webpage. How do you usually do this? Close it and type it in the address bar again? Click the Refresh Page button? A much faster way is to do Ctrl+R. In Windows, you can also hit the F5 key. To refresh the page without the cached copy, use Ctrl+Shift+R. Whether you have seven or twenty tabs open, going between them can be a hassle at times. Using keyboard shortcuts can lighten the load a bit and speed up the process. There are a couple methods of going about this. Ctrl+Tab and Ctrl+Shift+Tab move forward and back between tabs one at a time. Another method is to use Ctrl in combination with numbers. For example Ctrl+1 would take you to the first tab, Ctrl+2, the second and so on. This works all the way up to the 8th tab. Ctrl+9 switches to the very last tab, regardless the number. In Mac, Cmd+Option+Right Arrow and Cmd+Option+Left Arrow allow you to move back and forth. Think of this mode as your “productivity mode” since it allows you to only view one webpage at a time and displays it across your entire screen. In addition, you can actually still scroll through your tabs too by using the keyboard shortcuts mentioned earlier, but you just can’t see them. In Windows, the keyboard shortcut is F11. In Mac do Cmd+Shift+F to enable full screen mode. Note: Some keyboards, such as mine, have the Function keys set as “second function”, meaning you must use the Fn key to use them. Another method of opening new pages is to type in the address bar of the existing web page, but instead of just hitting Enter, which would load the new web page in your existing tab, do Alt+Enter (or Cmd+Return in Mac) and a new tab will open up with that address, without your current page affected. Either way works – it’s all about what works best for you and your system. Whenever you need to type in a URL or search something from the Omnibox in Chrome, next time try the keyboard shortcut Ctrl+L, which automatically selects the Omnibox. You can do this no matter where you’re at in Chrome. Similar to what we’ve already covered about not overwriting your current webpage, one of the biggest hassles is links which don’t automatically open in a new page. To get around this, hold Ctrl down while clicking the link, or if you have a middle mouse button, hover over the link and use the middle button to click it – it’ll automatically open in a new tab. In addition, Ctrl+Shift+Click will open the link in a new tab and select it. This is different from the other method, which opens the tab in the background. Although I don’t usually prefer lots of windows of Chrome, there are instances where you might want to separate groups of tabs from each other. But it’s a pain to drag and drop each tag individually to a new window. Instead, click one of the tabs you want to select it, then hold Ctrl or Shift down as you click all the others. Keep the keys pressed down as you drag the tabs away from the window and then release. This even works with pinned tabs. Pro Tip: Want to keep moving these tabs? They will stay together without holding Ctrl or Shift as long as you haven’t clicked another tab in the same window they’re in that was not in the original selection. For instance. Once I move those three tabs in the image below back to another window with other tabs and click a tab other than those three, I can no longer move them. Want to quickly bookmark a page? By using the shortcut Ctrl+D you can save the page that you’re on. Or if you’d like to save all the pages you’re viewing, use Ctrl+Shift+D. Sometimes it’s nice to have a little more screen real estate and by hiding the bookmarks bar you can achieve this. Ctrl+Shift+B is your command for this one. Did you know you don’t have to type http:// or www or .com in the address bar when you want to visit a website? You can always bypass http:// and www and if the domain ends in .com simply hit Ctrl+Enter (Mac: Cmd+Return) and Chrome will take care of the rest for you. Have you ever found yourself continuously hitting the Backspace or Delete key in Mac to find the page you were on 14 clicks back? What a hassle, especially if you have a slow connection and have to wait for each… page… to… load. There’s a better solution. Click and hold the page navigation arrows and a dropdown menu of all the previous pages you visited within that tab will appear. Magic right? Nope… just Chrome! Of course if you want all the Chrome history, it’s only a keyboard shortcut away with Ctrl+H. There are a lot of keyboard shortcuts that you can master, but a few non-browser specific ones are Ctrl+F to search any webpage for text, and my recent favorite (but Windows only) Start+Left Arrow/Right Arrow, which docks the current window to the left or right side of your screen – much easier than dragging it around. Keyboard shortcuts, without a doubt, will make you more efficient and perhaps even impress a few people in the process. 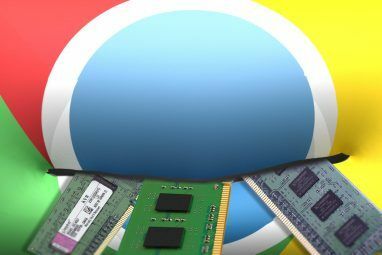 However, they are only the beginning though– there is a lot more to using Chrome as a power user. Be sure to watch for the second article for even more in-depth coverage. But for now, you have enough to keep your hands full. Do you have a favorite Chrome keyboard shortcut that I left out? Or perhaps you have a particular question about them? Either way, feel free to share them in the comments. Explore more about: Google Chrome, Keyboard. ALT + Search key for CAPS LOCK. Very useful! Bookmarking this page to come back anytime I need to. "Whenever you need to type in a URL or search something from the Omnibox in Chrome, next time try the keyboard shortcut Ctrl+L, which automatically selects the Omnibox. You can do this no matter where you’re at in Chrome." Not working on Windows 7 with Chrome in full screen. By "full screen" do you mean that you've pressed F11 and are viewing web pages in that way? If so, Chrome currently doesn't support that. Great info! Bookmarked for future reference. Some *very* basic shortcut that so many don't seem to know about: The use of Space to jump down a page in a longer page, and Shift+Space to jump up one page. It's kind of mindboggling that so many people use the mouse wheel or (even worse) the regular scrollbar. Yeah I use the spacebar all the time for that. It comes so natural, that it didn't even occur to me to add it. So thanks for mentioning it here! You can also use Alt+Left for Back, and Alt+Right for forward. For some reason, Chrome Linux delete Backspace and shift+backspace function, with the reason people often Back when they want to delete character in forms. An extention bringing back the functionality, but if you dual boot windows-linux, chrome's sync will make backspace button in windows unusable as Back button. One thing - Why CLICK & HOLD.? You can simply RIGHT CLICK on the arrows to show the page history. I suppose it's just one of those preference things. There are a lot of ways to do the same thing, so I tried to pick the most logical one for each tip. But the great thing about technology is that there are so many different methods, which is how we learn more. Will jump to the the nth tab. A look at the issues and bug reports for Chrome (see the December 12th discussion in this bug tracking thread https://code.google.com/p/chromium/issues/detail?id=78816) reveals that making it work for the Mac requires a full rewrite of the top of the browser tab behavior. Sniffle. Before I read this article, I was blissfully ignorant, and dragged my tabs one at a time. Now I know. It's outta reach... for now. Gah! No that stinks! I'm sorry Susan. I figured it would have been the same for both since I couldn't find anything saying it wasn't. That, honestly, is one of my favorite "tricks" and I actually discovered it WHILE writing the article. I was pretty stoked to find it out. Sorry this doesn't work for Mac yet, but hopefully it does soon. Thanks for reading! I guess I am a power user as I already knew the combinations (except the one about moving multiple tabs to new window). Many of the combinations are also available in Firefox and IExplorer. useful post thanks. I was FF disciple for years then at v9+ started 'hanging' on videos... tried EVERYTHING suggested - incl forums etc etc and contacted 'support'... nothing left until v15 and tried again (that's loyalty!!) 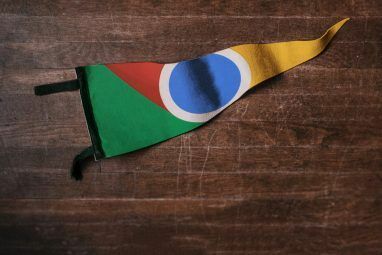 still screwed.... now I'm loving Chrome..
"Q – as having lots of bookmarks slows browser speed"
I too have never heard that having a lot of bookmarks slows browser speed. I would be more worried about the number of tabs open and extensions running before worrying about the bookmarks honestly. Thanks for this great article. I'll keep it on my bookmarks for reference. Ctrl-PgUp and Ctrl-PgDn to move/scroll between tabs. I did not know CTRL + L took you to the address bar. Though to be honest in my normal typing and computer use I find the ALT key much more useful for hot keys. I mention this because ALT + D Takes you to the address bar as well as in other browsers and File Explorer. (To note the L Variant does the same in Windows). Great post, Aaron! Very useful. You can also hold Shift and click the refresh button to refresh without the cached copy. Pretty sure Shift+F5 does the same. Also, F6 does what Ctrl+L does. I'm working on getting F5 added to the article (for some reason I forgot it), and I was debating on whether to include F6 or not. I suppose it wouldn't hurt! My new laptop has all the function keys only operable via the second function (Fn) key, so I'm finding myself using them less and their alternative shortcuts more. One thing worth mentioning: Ctrl+Shift+t (reopening tabs and/or windows) usually even works after a crash of Chrome/Chromium, when after a restart it sometimes opens an "empty" window with just one tab and no website loaded in it. Yep! It's in there. ;-) Thanks for reading! Yes, I do know that the shortcut is mentioned. But what did surprise me is the fact that it even works after a crash, when a "fresh" window is opened and you'd think that all your opened tabs are lost. Oh sorry -- misunderstood that. That IS interesting. Thanks for sharing that! Reopened Chrome and none of my tabs restored using Ctrl+Shift+T. I have used it more than once, and yes, it did work all the time, as far as I can remember. Whenever Chrome/Chromium crashed and opened with an empty window I was able to use the shortcut to get back the last window with all tabs reopened in it. And I don't have any extension installed that would deal with sessions, so it must be built into the browsers. just like the delete, but i prefer this one over the delete. Ohhh I didn't know about going forward -- I like that! I'll see if we can get that updated. Thanks for sharing and reading Eric! by the way you could also use CTRL+G instead of CTRL+F, useful if you'd accidentally press G.
Ha! You're right. Now I wonder how many times I'm actually pressing G instead of F :P Google's thinkin' there ;-) Does that work in other browsers too? Is that a Windows-wide shortcut? also works in firefox. actually when you use ctrl+g and hold ctrl while pressing G it functions as a next button in the find bar, its like ctrl+f with additional function. I love that! I've got to include that Ctrl+G works as a "find next" option. I wonder if there's a "find previous" shortcut now. Great find Eric! You know what, that's awesome! I was a huge FF fan... then Chrome came along and stole me away. Do I think it's "BETTER" than Firefox? For me, yes. But for someone else... not necessarily. I think "we" (being tech people in general) find too much fault in the alternatives, rather than embracing the fact that everyone is different and has different needs. Macs make work great for you, but not for me and so on. But alternative viewpoints are always welcome on MakeUseOf. Thanks for sharing! Can't you just use F5 to refresh the page if you want to use the cached copy? I didn't know about using Control-Shift-R, though. It is funny. PLEASE, don't take it seriously. Type firefox.com and press enter. Click the download status button which has appeared on the bottom of screen. You have become a Chrome power user. Valid point. And I really hope that improves sooner rather than later.